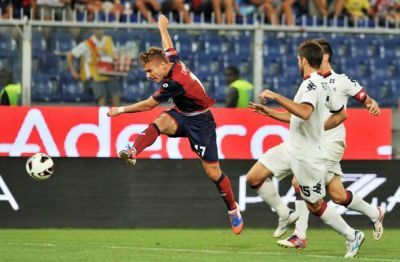 Genoa started the season with a 2-0 victory at home against Cagliari. Both goals were scored in the second half: Alexander Merkel (returned from A.C. Milan and now 100% a player of Genoa) scored in the 51st minute our first goal of the season after a good offensive action of Andreas Granqvist. The match was decided in the 85th minute by our new striker: Ciro Immobile (last year topscorer of Serie B with Pescara). A good match of the team of Gigi de Canio, 5 days before the end of the transferperiod. In the last 2 days of the transferperiod Genoa sold 5 players (Gilardino, Mesto, Zé Eduardo, Birsa and Tomovic) and bought 4 players (Borriello, Vargas, Ferronetti and Melazzi) which made the announced revolution of the team complete. 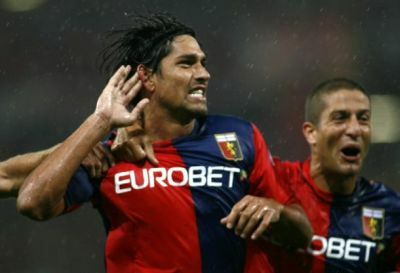 On Sunday 2nd September Vargas immideately started in the line-up while Borriello played the last 15 minutes in Catania. In the first half Catania was the strongest team in the field, but the only goal was scored by Juraj Kucka in the 26th minute after a perfect assist of Immobile. In the 67th and 69th minute Catania changed the score into 2-1 and the match seemed over. But this year the team is different comparing to last year and our vice-captain Bosko Jankovic scored with a very hard shot the 2-2 equalizer in the 82nd minute. Unfortunately Catania got a free kick in the 84th minute which was perfectly scored by Lodi: 3-2. Match over? No, in the last minutes Borriello was closed to the equalizer, but stopped by goalkeeper Andujar, Sampirisi headed a corner on the crossbar and Borriello was fouled in the penaltyarea. The refereee refused to give us a penalty, so we returned in Liguria without points but with a good feeling.